More and more businesses and homeowners are installing solar photovoltaic (PV) systems to generate electricity from Cape Town’s abundant sunshine. The City encourages this but, for safety reasons, your system must be registered and approved. The City of Cape Town would like to remind residents to register their Small Scale Embedded Generation (SSEG) systems before the end of May 2019. Solar Photovoltaic (PV) technology uses the light energy from the sun to generate electricity that can be used in your home. The investment case for installing a PV system is strong due to reducing costs and electricity tariffs increase. You can get credit for the excess electricity returned to the grid. You can read more below or the Going Solar in the Home page on the City’s website. 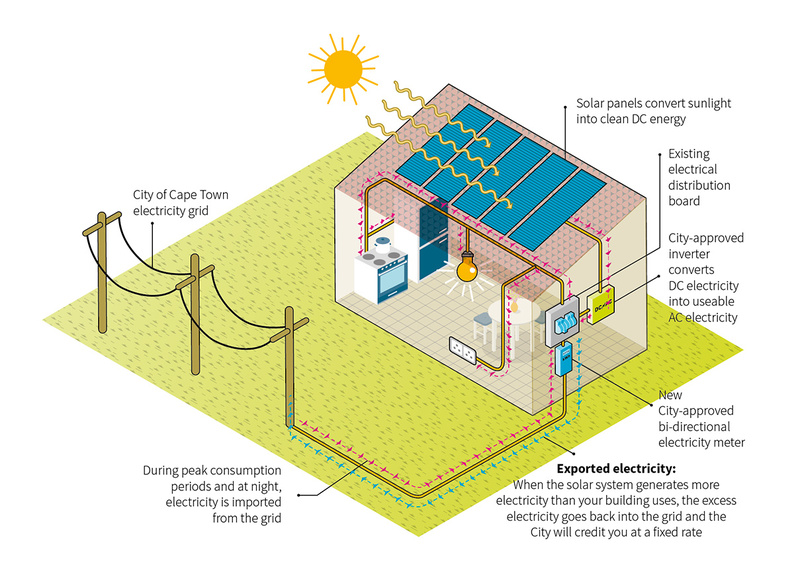 To ensure your system is safe and legal, follow the application process on www.capetown.gov.za/solarPV. See below and in the FAQs for more information. 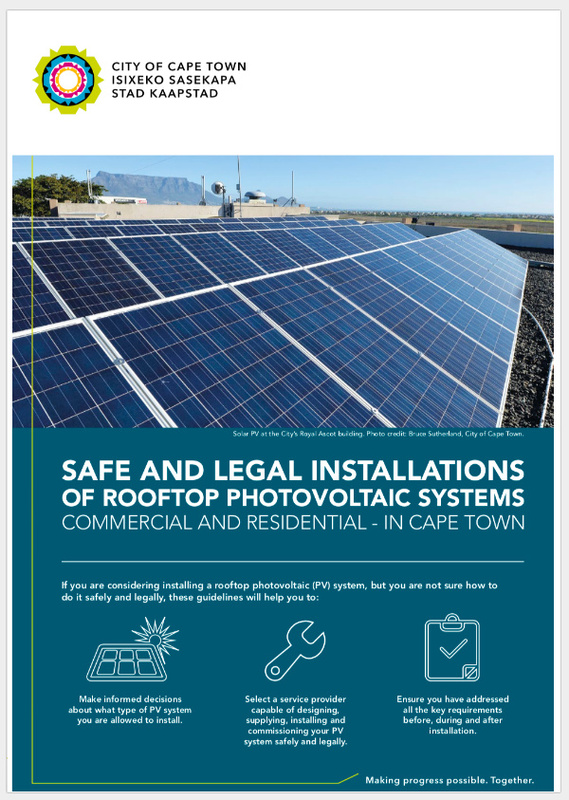 See our Guidelines for Safe and Legal PV installation in Cape Town for more information on installing solar PV in your home (or business). This document will guide you through choosing a PV system and design, and includes a helpful checklist for before, during and after installation as well as helping you choose a good service provider. All solar PV systems installed within the City of Cape Town electricity supply area must be registered for authorisation by the City. See here for more information. Residents have the option of registering a feed-in system which allows you to export excess electricity to the grid and receive credit based on the SSEG tariff. You can see information about the SSEG tariff on this info sheet. 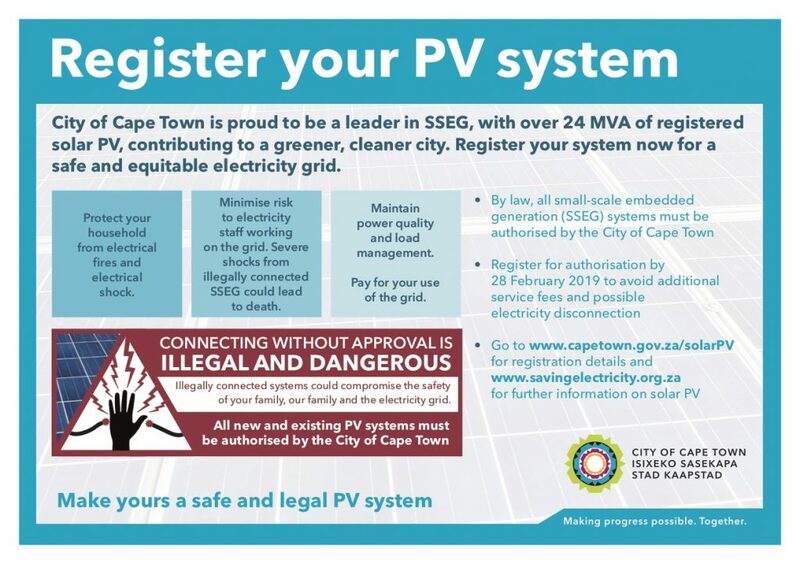 Click here to see the recent media release from the City of Cape Town encouraging residents to register their PV systems. You can also download a letter from the Director of Electricity Generation and Distribution Department urging owners of solar PV systems to register for authorisation before 31 May 2019. It does not apply to solar thermal/solar water heaters, and there is no registration fee. The application process is fully described at http://www.capetown.gov.za/solarPV. The City of Cape Town supports the South African Photovoltaic Industry Association’s (SAPVIA) PV GreenCard Programme, an industry led quality certification provided by qualified installers to their clients on completion of a project. You can find out more about the programme and see a list of approved installers at www.pvgreencard.co.za.